A simple NOD goes a long way. Hello, my name is Laura. 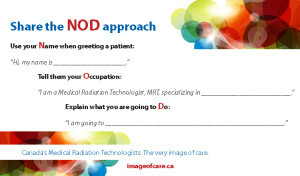 I am your medical radiation technologist, and today I am going to x-ray your hip. Our brand research demonstrated that we have ‘high touch’ with patients – some ten million patients see our members for an imaging procedure or therapeutic treatment every year. Ten million NODs will have an impact. 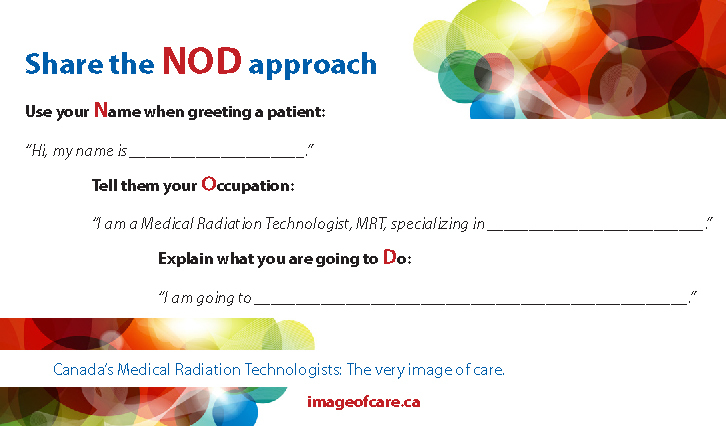 At the Thunder Bay Regional Health Sciences Centre, staff members in the diagnostic imaging department have introduced a straight-forward program called NOD. They have established an expectation that all MRTs will give a NOD to each patient.